Places to Visit: Delhi - Delhi Agra and Back to Delhi. Kumar India Tours offering Delhi To Agra Taj Mahal Same Day Tour Packages By Car and Driver. Duration :- Delhi To Agra Same Day and Overnight Taj Mahal/Red Fort and Fatehpur Sikri Journey Tour Packages - Call @ 9312215180/9811431783. 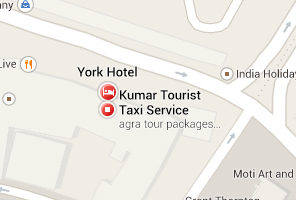 Day 01 :- Pick-up from Delhi - Airport - Railway Station - Hotel & proceed to Agra Same Day Taj Mahal Tour By Car. Provide Qualified English Speaking Guide In Agra. See Agra Taj Mahal :- Taj Mahal One of the seven wonders of the world Taj Mahal was built by a grief stricken Emperor Shahjahan as a memorial to his beloved wife Mumtaz Mahal. A world-renowned wonder, Taj Mahal sits pretty on the northern side of this green paradise. It looks the same from all the four sides! The Quranic inscriptions on its four entrances are carved in such subtle increase in size that may appear to be of the same size from top to bottom! Shahjahan invited master craftsmen from as far as Italy and Persia to help design his ambitious tribute to love. Taj Mahal is phenomenal not in the beauty alone that shines forth, but in the deep planning and design that went into its making, and the ethereal idea of immortalizing love. 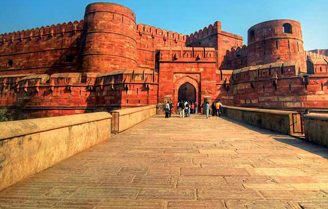 See Agra Red Fort in Agra City :-The great Mughal Emperor Akbar commissioned the construction of the Agra Fort in 1666, A.D. although additions were made till the time of his grandson Shahjahan. The forbidding exteriors of this fort hide an inner paradise. There are a number of exquisite buildings like Moti Masjid - a white marble mosque akin to a perfect pearl; Diwan-I-Am, Diwan-I-Khaas, Musamman Burj - where Shahjahan died in 1666 A.D. Jahangir's Palace; Khaas Mahal and Shish Mahal. See Itmad-ud-daula(Baby Taj) :- Itmad-ud-daula has a special place in the chronicles of both history as well as architecture. This is precisely because Itmad ud Daula is the very first tomb in India that is entirely made out of Marble. This is actually a mausoleum that overlooks the River Yamuna and is a tomb of Mir Ghiyas Beg, a minister in the court of Shah Jahan. See Akbar’s Tomb at Sikandra :-One of famous mugal Era building in Agra and most visit tourist place of Agra. Sikandra fort is also known as mausoleum of Akbar. Fort of sikandra has blending of Islamic, Jain, Hindu and Christian theme. Fort of Sikandra is named after ruler of Delhi Sikandar lodhi, which was the ruler of Delhi in the year 1488 to 1517. Fort of Sikandra was built by Akbar. After death of Akbar it is continued by Jahangir son of Akbar. This fort is located about at a distance of 10 kms from the city centre. 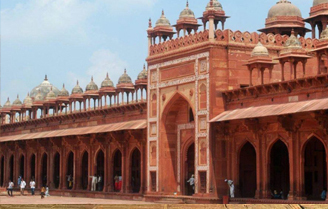 See the Fatehpur Sikri in Agra City :- the deserted red Sandstone City, Emperor Akbar built that as his capital and palace in the late 16th century is an exhilarating experience. It a veritable fairytale city and its "ruins" are in pristine condition ... it's not hard to imagine what the court life must have been like in the days of it's grandeur. After Proceed back to Delhi :-Finally you will proceed back to Delhi along with an impression of TaJ Mahaland a sheer magic that the Taj exudes making it an unforgettable and cherished image forever. Arrive Delhi Drop On Choice Destination in Delhi. Take Yamuna Expressway to Avoid Traffic and More Time from Delhi. Agra Taj Mahal Will Closed Every Friday in Week. Call @ 9312215180/9811431783 Visit Sunrise Agra Same Day Taj Mahal Tour Tour Packages From in Delhi Hire Car and Driver Service. Visit India Top Favorite Place Taj Mahal at Sunrise on this Full-Day Agra Taj Mahal Tour by Car from Delhi. For Your Favorite Pickup Place from hotel in Delhi/Gurgaon/Noida or Delhi Airport and Travel Delhi to Agra by Our Tourist Taxi and Driver. 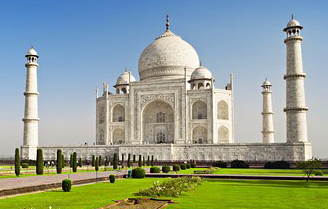 Plan to see your Sunrise Taj Mahal Agra City Tour in Utter Pradesh. We provide Tourist AC Car/Mini Coach 9 to 12 Seater Deluxe 1x1 Tempo Traveller and English Speaking Driver, Guide & More. Call @ 9312215180/9811431783 Booked Cheap and Best Online Delhi To Agra Taj Mahal Same Day Round Tour Packages By Car Rental Taxi Hire Services And get best deals on your Cabs booking for Delhi to Agra Car/Taxi Rental Services Available for all Cabs types AC, Non AC, Economical, Sedan, SUV, and Deluxe 1x1 Maharaja Tempo Traveller. Call @ 9312215180/9811431783 Car/Taxi Hire in Delhi to Agra Taj Mahal Sightseeing in Same Day Round Tour Packages by Cars considering your budget and group size like Maruti Swift Dzire/Toyota Etios, Toyota Innova, Innova Crysta Car, deluxe 1x1 Tempo Traveller, are few of our most popular car models Our Drivers are trained to follow the best practices in customer service and they will make sure that your journey in Car/Taxi Hire from Delhi to Agra is hassle-free and convenient.